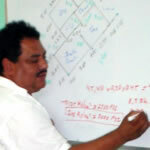 Nicaraguan builder, Martin Gutierrez, participates in programs of apprentice education with two vocational education institutions as well as housing programs of SofoNic. He cannot hide his enthusiasm of contributing to the development of the young people in his country. Over the years he has included electricians, plumbers, welders and masons will now integrate three students who are about to graduate as construction foremen, but require a practical experience. He also has incorporated recently graduated engineers as construction supervisors. The young people are exposed to a wide variety of situations from housing settlements to apartment buildings to individual upmarket dwellings. Nicaraguan builder, Martin Gutierrez, participates in programs of apprentice education with two vocational education institutions as well as housing programs of SofoNic. In a conversation with him he couldn’t hide his enthusiasm of contributing to the development of the young apprentices. After including electricians, plumbers, welders and masons he is now starting to integrate three students that are soon going to graduate as foremen. They are going to start their practice in three of his constructions in middle of august. In a meeting with the teachers manager of the INTECNA (national technology institute) in Granada they decided where to send the three young foremen. One is going to work in San Juan del Sur in a building with 18 apartments. Two are going to work in Granada itself, one in the construction of two houses and the other in urbanization of 50 houses. 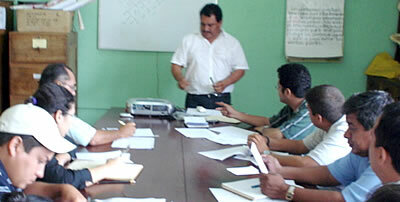 During the past 4 years the constructor has also been working with apprentices of the polytechnic institute of Jinotepe. Electricians, plumbers and welders have past their 540 hours of practices in constructions managed by Martin Gutierrez. Because this is specialized work that is done in specific faze of a global construction this apprentices are paid by the hour. 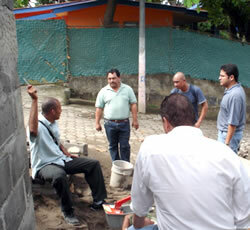 The situation with the foremen is different because they are in charge of the construction during the whole process. 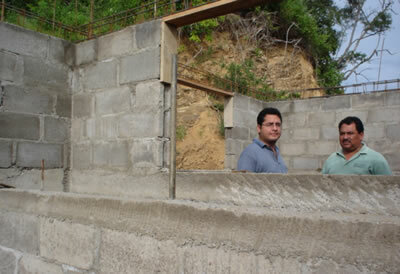 Martin Gutierrez also has three young engineers supervising the constructions. He started an interesting discussion about the rival between the engineers and the foremen. It is important that the main mason knows that the engineer has the dominion of the theoretical knowledge. Even dough they have a lot of theory their practical knowledge is limited. “For example” said martin, “ they don’t know how to retrace a building. They have to learn how to make sure the heights are controlled. They have learned how the columns and beams are being done, they learn about the mortar and concrete relations in the site”. He has also worked with masonry apprentices of the social housing project of SofoNic, in an occasion where he had a lot of work in San Juan del Sur. For him masonry is the most important activity on the site because it makes the building rise. It includes armed beams, columns, walls, plaster, collocation of tiles and other floor types, etc. Martin expresses that depending on the work volume in the future their will be possibilities for the apprentices to work with him once they graduate. The time of practice now is a good opportunity to know each other. “The idea is to give this projects continuation, make sure to have enough work in the future to be able to work with this young people that have learned a profession”, says the constructor.